In an inventive legal action, two lawyers for the West Bank Palestinian village of Bi’ilin have filed a civil statement of claim against a pair of Jewish-owned Canadian construction companies building condominiums in the village for Israeli settlers. Damages of $2 million Canadian (Dh7.3m) are sought as compensation, the suit said, for “crimes against humanity” alleged to have been committed by the occupying Israeli forces. The incoming settlers represent a transfer of the occupier’s civilian population to occupied territory, illegal under international war crimes law. The statement of claim argues that the Canadian companies are “aiding and abetting” building of illegal housing on Palestinian land occupied by Israel since 1967, in contravention of Canadian war crimes legislation and the Geneva Convention. Under Canadian war crimes legislation, itself governed by the Geneva Convention, illegal occupation of a conquered territory is a crime against humanity. “Very simply,” said Mark Arnold, the Canadian co-counsel who has acted against the Iranian government in a torture case, “the fourth Geneva Convention forbids the settlements”. 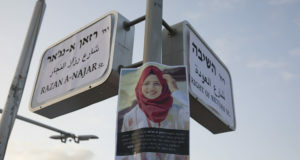 For nearly three years, the village, west of Ramallah and north of Jerusalem, has been the focus of weekly protests against the 680-km dividing wall – the so-called “separation wall” – that runs through village territory. Bi’ilin stands near the Green Line, the only internationally recognised boundary on the West Bank. It is legally an occupied territory. 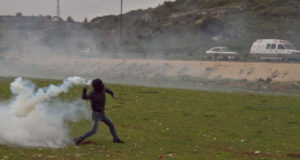 The Bi’ilin protests have been marred by demonstrators throwing rocks and retaliation by Israel Defence Forces. Last month, the visiting vice president of the European parliament, a Northern Irish Nobel Peace Prize laureate and a senior Italian judge were all injured in a fracas at the Bi’ilin wall. This is not the first time Bi’ilin has appeared in legal documents. Bi’ilin won a limited victory in the Israeli supreme court in September, when the court ordered the IDF to move the wall 1.7km back towards the Green Line. But the novel legal action before the superior court in Montreal leads back not to the Green Line but to the highly successful Canadian housing construction firm of Green Park, headquartered in Montreal – a curious turn of events in the war for public opinion between the Palestinians and the Israelis. Green Park, owned by Shaya Boymelgreen, a New York-based real estate magnate, is a multinational building and development firm. Mr Boymelgreen’s business has no connection to Canada’s residential development company Greenpark International or its affiliates. Mr Boymelgreen himself, long regarded as a virtuoso developer, has undertaken some of the most successful – and controversial – New York City development projects of the past decade, including several spectacular Manhattan and Brooklyn successes with his former partner, Lev Leviev. The two went their separate ways in 2007, and Mr Leviev is not named in the Montreal statement of claim. It is no coincidence the Palestinian legal manoeuvre targets Mr Boymelgreen via existing Canadian war crimes legislation. The legislation that the Palestinians’ lawyers argue has jurisdiction over the Green Park Bi’ilin settlements project was first enacted in 1987 to enable prosecution of Nazi-era war crimes suspects then alive who were residents of Canada. The Canadian war crimes legislation, which failed to produce the conviction of a single Nazi war crimes suspect, largely because of the presiding judges’ reluctance to admit evidence of elderly Second World War victims, has since allowed for the trial of a senior Rwandan official alleged to have sparked the 1995 genocide. In 2000, Canada was the first country to bring The Hague’s International Criminal Court occupation statute into its own war crimes laws; the so-called Rome Statute forbids an occupying power from transferring its civilian population into territory the occupier controls as the spoils of war. Canadian war crimes legislation has “universal jurisdiction”: the law applies to anyone anywhere. Canada is thus an ideal jurisdiction to argue that the villagers of Bi’ilin have recourse in a non-Israeli court of law to argue their case. The Bi’ilin lawsuit, Mr Arnold said, has been more than a year in preparation. Approached by a Canadian academic to examine the villagers’ situation, Mr Arnold, a civil litigator specialising in condominium law and human rights cases, partnered with Michael Sfard, an Israeli lawyer, and began their strategy. The Bi’ilin wall cuts off the village from its surrounding farmland; the Sept 2007 ruling ordering the wall’s relocation has not yet been enforced. Should the Bi’ilin villagers win, Mr Arnold and his co-counsel plan to argue before an Israeli court that the damages award – which is only valid in Quebec – should be ordered paid in Israel and a Quebec court-ordered injunction forbid further construction be imposed at Bi’ilin. Green Park has filed a motion with the Montreal court to defend against the suit.